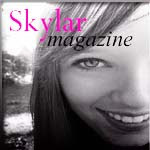 This week's hot blog of the week is Skylar Magazine, which is written by Sarah. At Skylar Magazine you can find lots fashionable tips and inspiration. Congratulations to Sarah at Skylar Magazine, you have won a free week's advertising spot at Frugality Is Free and Being Frugal and Making It Work. I am a new Follower of your Blog from Jamaica. Take care and have a good Monday and week. All Your Life We Owned The Night…when? Tonight Tonight!